Surface scans allow for high resolution capturing of small details down to the range of a few microns. 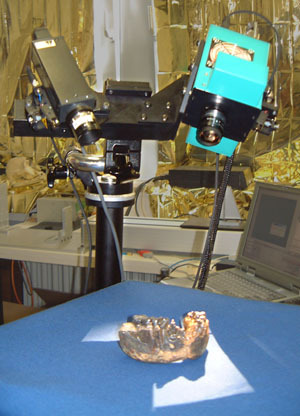 Surface scanners can be equipped with digital cameras to include texture information and to produce realistic looking models. When only landmark or contour data are needed, more inexpensive digitizers (e.g., Microscribe 3D) are adequate. Using a stylus which is attached to a flexible arm, the landmarks, and samples from curves or surfaces of a physical object can be recorded as point locations in a Cartesian coordinate system.